These are a favorite from my husband’s childhood. When we go to visit his parents at the family camp, he always requests half moon cookies from the family’s favorite bakery, Harrison Bakery in Syracuse. In fact when I asked his mother for the recipe, she said that she didn’t make them because they have always bought the cookies at Harrison. They come in both chocolate and vanilla versions, but my husband’s favorite is the chocolate. 1. COOKIES – Preheat oven to 350° F/175° C.
2. Cream together sugar, brown sugar, and shortening. Add egg and mix until combined. 3. In a separate bowl, stir together flour, cocoa, salt, baking soda, and baking powder until cocoa is distributed throughout. Add to wet ingredients and alternate with milk a little at a time and mix until thoroughly combined. The mixture will resemble a thick cake batter. 4. Scoop and drop onto lined cookie sheet. Shake cookie sheet slightly to allow batter to settle down. 5. Bake for 10 to 12 minutes and remove from oven. Allow cookies to sit on pan for a minute or two before removing and placing on a wire rack to cool. 6. Turn the cookie over and frost the back side of the cookie with vanilla frosting on one half and chocolate frosting on the other half. I usually put on a thin layer, a crumb layer, at first and let it firm up. Then I add a second layer. This keeps the crumbs from mixing into the top layer of frosting and makes the cookies prettier. 7. FROSTING – Combine all ingredients except the cocoa. Beat until smooth. 8. Divide mixture in half. Add melted chocolate to half of the frosting and stir well. Keep the frosting slightly warmer than room temperature for easier spreading. I wrap each cookie individually in plastic wrap once the frosting is set. This helps the cookies keep longer. Do not refrigerate the cookies, or they will be hard, like cold cake. The frosting recipe is slightly different from others I’ve found. Most of the frosting recipes I’ve seen are simple water and sugar glazes, but my husband prefers the buttercream frosting. My boyfriend is also an Upstate New Yorker, and is a Half Moon Cookie fiend! A friend found some packaged cookies at a store in the DC area, which prompted some searching for recipes for the cookies so we could make them at home. Your site, and references to Syracuse made him feel right at home and the recipe a soon to be favorite! Thanks! Great! I hope that you and your boyfriend enjoy them. I’ve tried your recipe for choc. half moon cookies and my family loved them and yes I’m from upstate NY. Great recipe. Hi and thanks for sharing this recipe!!! Whenever I visit Syracuse, NY, my first stop is Harrison Bakery for some Half Moon Cookies!!! Nobody has heard of them out here in Colorado! Thank you so much! This is a wonderful recipe. Check Wegmans! They make FANTASTIC chocolate half Moon cookies!!! I also grew up in upstate NY and now live in Southeast Louisiana. I was shocked when I first moved here and nobody had heard of Half Moon cookies. I’ve tried making them but can’t seem to get the cookie dough quite right. I miss them and am going to try to bake them again using this recipe. Thanks! I love halfmoon cookies!!! My sister has to send them to me from Syracuse..and I am very familiar Harrison Bakery. I’m from East Syracuse and we had halfmoon cookies from Harrison Bakery all the time. It was part of my childhood. Now that I live in Idaho, having my sister send them to me is the only way I can get them. They are sold in Wegmans grocery store and used to be sold in the IGA also but the bakery cookies were the best. I have a recipe for them that was from the area….but I am really happy to have this one. These are such a treat for me. Yeah! I’m originally from Elmira, NY and remember getting these from the now defunct Mohawk Bakery. Currently in SC after 31 years in CA and these really are an upstate NY secret. Thanks for the recipe-the one I have makes them too dry. I am originally from Horseheads, NY and got such a trip down memory lane reading your comments. I also remember vividly having jelly donuts from Mohawk (Mohegan’s) Bakery and creme puffs from Rossi’s Bakery….but the half moons were the best! I look forward to trying the recipe….my mouth is watering! Hi Jennifer. I make everything you see on this site, including both the chocolate and vanilla half moon cookies, and my husband likes them both (but the chocolate ones are his favorite). They turn out cake-like, and the frosting is buttercream, not a glaze. Obviously I cannot say if they are exactly like the half moons your husband had in his childhood, and the recipe seems to vary slightly by town or region, but my husband says these are pretty much like what he remembers. I’m also from Upstate NY! ha… from the Rochester area (Penfield specifically) and wanted to get some moon cookies out here in Denver… the friend I was with had never heard of them and I thought that was nuts. I didn’t realize they’re only from NY. – Didn’t the Seinfeld episode make them famous?? Excellent! I’m originally from Oneida and have been living in New York City for the last ten years. I have YET to find a half moon (down here, they’re called “black and white’s”) as good as the ones from my childhood (shout out to the long-since-gone Dan-Dee Donuts). Gotta have the buttercream frosting: a half moon with the glaze is a totally different (and deficient) animal altogether. Can’t wait to try this out this weekend! Manager of DD Oneida for 12 years ! Made 432 Halfmoons a week. 269568 total, while i was there. From Elmira and remember Mohawk’s cookies. Lights Bakery still makes them. In Oregon for 30+ years and would get that glazed eye stare from others when seeking half moon cookies. Visit Elmira once a year and my sister knows she had better have at least one with her when she picks me up at the airport! Will try this recipe tomorrow. I, too, am from Syracuse and living outside of Philly now. Can’t get half-moons here, except occasionally at Starbucks, and they’re not nearly as good as the ones from Harrison Bakery. My husband also prefers the chocolate, but I actually like the white-bottomed ones. Do you have a recipe for those too? Thanks so much, I’m so excited to try this! It must be that time of year. Also an upstater, Cooperstown, and craving half moons for some reason. Can’t wait to try these tomorrow. How long do the cookies stay good for? My twin loves these cookies and I want to make them for her for x-mas but she lives a few hours away so I have to make them ahead of time and travel with them. When should I make them? The day before I leave or can I make them a couple days before I leave? Samantha, the cookies are best within a day or two of making them as they tend to dry out over time. Follow the instructions to wrap each cookie individually after the frosting sets up, and that will help them last a little longer. Hi, I’m also from upstate NY, (Fonda) and used to love the Chocolate Jumbo cookies with buttercream frosting at Wemple & Edicks. Does anyone have their receipe? No one in Florida has ever heard of those cookies and they don’t know what they are missing. Thanks for any help. Preheat oven to 375. Drop by rounded teaspoon on ungreased cookie sheet. Bake 8-10 minutes or until done. Hi Pat. So far I have not come across a recipe for the chocolate jumbo cookies you mentioned, but if I do I’ll be sure to post about it my blog. Just want to say THANKS for the great recipe – my boys loved them growing up in Syracuse, and we would get them at Harrison’s Bakery or the little bakery on Court Street near Kuhl Avenue where we lived – yum yum! We live in Bradenton Florida now but some things are irreplaceable like these great cookies! Down here they call them Black and Whites, and sometimes we can get them at Publix Supermarket, but not often. Utica.N.Y supposedly was/is the birthplace of the yummy cookies(supposedly),born and raised there I sure miss the Half Moons as well as a lot of other foods. I sure hope some of those gosh darn good bakeries have stood the test of time and are thriving with no thanks to the WalMart and other chain grocery stores. Living in Houston,Tx., good bakeries are hard to find and only just recently are starting to make a come back. Cheers to all my fellow upstate New Yorkers!!! And many thanks for this receipe I will treasure it!!!! Thanks for this! I can’t wait to try and make it….I too am from upstate and while I moved back to NYC I have a house just north of Syracuse. I like chocolate 1/2 moon cookies better than the lemony ones!!! I don’t know why I started thinking about half-moons today. I live in Syracuse and drive by the Harrison Bakery occasionally .Now I’ll have to stop for some half moons. At least I have your recipe now in case I just have to bake some. It may be warmer elsewhere in this country but at least we have our half moons in Syracuse. Hi Darla. I’m sorry, I do not have that recipe, but if I find it I will definitely write about it. I believe the original Half Moon Cookie came from Hemstrought’s Bakery in Utica New York. The retail side of the business has closed but they are still being made for some Utica outlts. I heard Chanatry’s was one. I have been told this is about 90% correct. It is believed the different makers of the ingredients may cause the taste to vary. Hemstrought`s Bakery generously shared its recipe with us, but we had to adapt the quantities: The original makes 2,400 cookies! Melt bittersweet and semisweet chocolates and butter in the top of a double boiler over simmering water over medium heat. Add confectioners` sugar, corn syrup, vanilla, salt, and 6 tbsp. boiling water and mix to a smooth, stiff paste with a rubber spatula. Thin icing with up to 8 tbsp. more boiling water. Icing should fall from a spoon in thick ribbons. Keep icing warm in a double boiler over low heat. What a wonderful find. Grew up in Utica and used to buy a Black and White every afternoon on my way home from John F. Hughes Elementary School. Have been back to Utica recently and was disappointed that Hemstroughts was not there. About five years ago they still had a store in Clinton but the cookies were not the same. Tasted chemically- like they switched to a mix. Big disappointment. Will try the recipe and hope they reproduce the taste of the originals. I moved to NYC in the mid-60s to attend NYU and imagine my surprise when their Black and Whites were only available in a vanilla or lemon cookie version. They were meant to be chocolate- as anyone from Upstate NY knows. Hemstroughts used to vary them however by frosting some entirely with vanilla and others with all chocolate icing. Their chocolate icing was the best-smooth and oh, so chocolatey. Hi Patricia. Thanks for sharing the Hemstrought’s Bakery recipe! I am from Elmira and you can’t even find a “black and white” here in Toledo. We order a dozen per family at Christmas and have the shipped, and you would think we were giving away cherished heirloom presents! I am originally from Oneida and have fond memories of both vanilla and chocolate half moon cookies. Thank you so much for sharing this recipe treasure! How I miss the traditional bakery products that are so long gone but mostly I’ve missed half moon cookies! What a kick to read so many fans of half moon cookies from Syracuse. I was disappointed when Snowflake Bakery closed but Harrison’s were really good too. And someone told me Harrison on Genessee in Dewitt closed. Is there another Harrision that’s still open?? I truly miss the old standby when I visit NY…we do have them here in Nashville but they don’t hold a candle to Harrison and Snowflake. we are from the Syracuse area.We moved to South carolina 5 1/2 yrs ago.we have been looking for half moons.We were never able to find them.I was on line looking for some new Christmas cookies and I found your web site I made them last night and they didn’t last 24 hrs.Thank you We missed them so much. Andrea…my husband and I are originally from Syracuse…now living in Tenessee. We grew up eating Harrisons Bakery half moon cookies! In my family, Harrison’s bakery was the first stop after church on Sundays( even before stopping at Durstons for the NY times). Harrison’s is also the first place we go when we come home to visit! Our children are huge fans too. Several years ago, I received a version of the recipe. I tried to share it with a local bakery here…and they refused to frost the bottoms! Haha…and they tried to charge an arm and a leg for a single cookie( Harrison’s is very reasonably priced). Needless to say they did not make them for very long, nor did they remain in business. Not a single good bakery in our area( another NY novelty we miss). We were thrilled to find your recipe! We made them last night. Amazing! Although they are not Harrison’s…We are grateful for the taste of home this Holiday season! Thank you!! I was so glad to find this yummy halfmoon recipe! I am from Elmira and have always gone to either Light’s Bakery or Kountry Krullers (they make the BEST vanilla half moons). It will be so nice to be able to bake some of my own, but they will never taste as good as the ones fromthe bakery. I just made these last night as a Valentine’s dessert for my husband. I LOVE THIS RECIPE! Thanks for sharing. I really think that they taste better than the ones that I am used to. I am not a big fan of these from the store but yours are worth it! Thank you so much for posting this recipe. My grandfather worked most of his life at Harrisons Bakery (the one across from Sacret Heart) and now that I’ve moved away I can never find these cookies anywhere. This brings back very fond memories. Yep – I’m from Upstate NY. Spiedies and Half Moons rock. These cookies remind me of my childhood. I’d love to work through a batch right now, thanks for the recipe. Would like to try my hand soon at making them. Mine came out a little too sticky, fragile and did not really rise. The taste was authentic (upstate NY), though. So I’d like to try again. Could it be that my baking soda and baking powder are too old and have lost their leavening properties? Thanks for any tips, I’m a new baker. Hi Joanne. I’m glad you tried the half moon cookies and sorry to hear they didn’t rise for you. Baking powder especially loses its leavening properties the longer it sits, so the first thing I would try is some fresh baking powder. Another thing would be to check the batter consistency. You can add another tablespoon or two of flour if the batter looks too thin. I grew up in Cortland, New York and always bought a half moon cookie whenever I passed the bakery on Main Street. Here in Idaho no one is familiar with the cookie. I look forward to trying this recipie. I also grew up in Cortland in the 60’s and Grants Bakery was the place (long gone, now). As a little kid, I remeber being confused when folks called them “cookies.” Sure, based on size and shape they’re cookies, but a really good half-moon is much more like a cake — and that cake must be chocolate! Now I live in Western North Carolina. I say Half-Moon and people hear Moon Pie… it’s very sad. But then, we never had hushpuppies in New York, so things sort of balance out. Hi Karen. Yes, we adore Harrison’s rye and pumpernickel! I live in chandler AZ now, and i am missing Rochester half moons! we have restaurant here that calls them black and whites, which are not nearly like NY half moons! I am going to try this recipe and i am soo excited! i cant seem to find the vaniella cookie recipe on here that someone said it was? I like white cookies better.. where is that recipe? Hi Julie. I’ve posted the vanilla half moon recipe as well, it’s linked in the description above. I was just wondering if one could use cooking oil instead of shortening, cuz I’ve done it in some other recipes and I actually rather, but was wandering if you had tried it, so that I wont make a mess when trying. If you haven’t tell me and I’ll let you know how it went. I haven’t made these with cooking oil, so feel free to try it out and let us know how it worked for you. Hahahahaha – My husband works in Elmira, and I’m from Utica, and we were looking for a half moon cookie recipe. I was really excited to look it up in my new Cook’s Illustrated Baking Book. They had something called a Black and White cookie which had a white cake bottom with lemon…What? Then we started thinking that Half Moons were regional. I’m getting a kick out of this site because it lists all these central NY places where people remember getting Half Moons. Awesome. Can’t wait to try the recipe and spread the love. Ha ha ha. Anybody familiar with Utica’s chicken riggies? How bout tomato pie. I guess they are kind of special to that area. They are super regional! Half-moons, which are a chocolate cake bottom, are from central NY, all the others are Black & Whites. This has been a bone of contention in my house for a while now. I live in Albany. The first time I was asked if I wanted a half-moon and was giving a white sugar cookie(!?!?!) with chocolate and vanilla frosting. What a disappointment! I am from the Utica- Rome Area- Home of Riggies, Tomato Pie, Turkey Joints, Croghan Bologna, and Hemstroughts Half-Moon Cookies! Oh and Greens! Can’t forget the Greens! Ok now I’m hungry Andrea! Riggies and greens and half moons oh my! My husband and I moved south to Scranton, PA, so we are only 2.5 hours from New Hartford, NY where he is from, so luckily we are still able to get the traditional Utica food or have our relatives bring it to us. 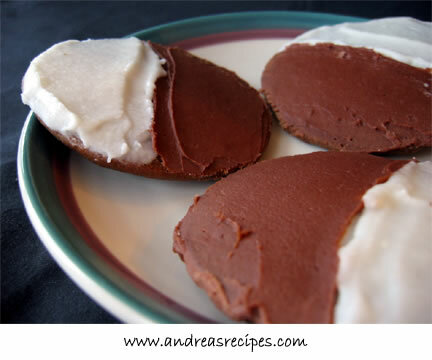 A Central New Yorker (Cortland County), tired of the constant correction of a colleague that Half Moon Cookies are really “black and whites”, I decided to make them today, using your recipe. Thanks so much for sharing it. I am from upstate New York and thought this was a universal cookie. Just reading these comments I have discovered otherwise. I can remember attending church school in the late fifties (when they gave you early release from school to go to classes) and on the way home always stopped at a bakery on the main street and bought a half moon cookie. I think it only cost $.05 at the time! We have bakeries here who make them still so I can still enjoy them but, I am going to try these recipes and make my own! These comments bring back some nice memories! Another former Syracuse citizen, now in southern california. Have relatives visiting so going to try these. Harrison Bakery……how about the italian and rye bread…..headlights!!! I miss fried haddock! Hoffman Coonies and Franks and all the good polish food. These are the best cookies ever make love the Chocolate. Hi, I was on Pinterest looking for the perfect half moon cookie recipe of my childhood, when I saw Syracuse, NY. That’s all that I had to see. I live in Fulton, NY now but grew up in Syracuse. My Grandpa Sam used to buy us kids half moon cookies that were made by a witch that lived on the moon. This witch only made them for good children. HA! The things that adults will tell children… I later found out that they were made at the Snowflake Bakery around the corner. I have never had a cookie that comes close. The next time that I’m in Syracuse, I will have to try Harrison’s. God they make the best rye! I live in Ithaca, NY and I was in love with half moon cookies. Could not get enough of them!!! Ithaca Bakery in the Commons was my favorite place. I’ve never had a cookie as good as a half-moon. I’ve lives in California for the last 20 years and have missed them so much. I’m making these tomorrow!! I’m from near Syracuse NY, and these were my favorite thing growing up! I’ve made these twice now. I learned to add about a quarter cup more flour. And in my oven I need to bake them for almost 15 minutes or else they are too fragile. Also the frosting recipe doesn’t make enough, so I make about 25% more. Don’t make the frosting too thick, it will get thicker as it cools. If it gets to thick a bit more warm milk will soften it up. Thank you Andrea! Ex-pat Upstate New Yorker here, a former Clintonian to be exact, where the Battle of the Half Moons was between Holland Farms (the old-timer) and Hemstrought’s (the newbie, at least in Clinton). Neither company still has a store in Clinton, but you can still buy those delicious half moons at the Holland Farms in Yorkville. Oh, and North Star Orchards on route 233 has adorable miniature half moons, which are also delicious and really much better for my pesky hemoglobin A1c now that I am in middle age!